Yes, people have been making pizzas in their home ovens for a long time now. In the last few years, though, we’ve seen plenty of innovation in the space, with wood-fired ovens, wood-fired substitutes, and all sorts of countertop pizza makers vying for a place in people’s kitchens (and backyards). We know, it’s still more convenient to pick up the phone and order a large pepperoni from the nearby pizzeria, but if you actually enjoy making your own pizza at home, we imagine you’ll want to pick up one of the products we list down below. Some people want to make fancy wood-fired pizza at home. Others just want to be able to cook frozen pizzas and dough-and-topping recipes they put together themselves in the most convenient way possible, with no regard for whether it passes for Neapolitan-style or not. You know, something simple and uncomplicated. These products should make a suitable choice for that crowd. Unlike the full-fledged pizza ovens on our list, this one doesn’t get temperatures anywhere near 800 or 900 degrees Fahrenheit. That’s because it’s more of a pan than an oven that you put on top of a gas stove to heat up. According to the outfit, it can preheat to 600 degrees Fahrenheit in around 15 minutes (just turn up the stove to maximum heat), at which point, it can cook an actual pizza in around six minutes. We know, that’s not nearly as convenient as the one- or two-minute cooking times other options offer, but for many homeowners, this will probably be a better solution, considering it only takes up similar room to many cookware while still cranking out delicious pizzas in small batches. If you’re just making pizzas for one to three people, in fact, this may actually make for the ideal option. 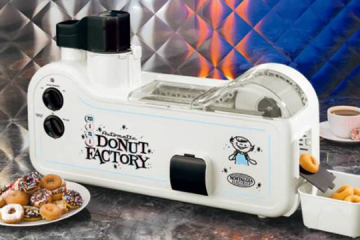 It’s one of those appliances that look absolutely counterintuitive. We mean, pizza ovens usually comes with insulated enclosures to build up enough heat to cook the darn things. This thing, on the other hand, is a wide open tray, with nothing but a slice-sized heating element on one side pushing heat down to the tray. Yet, it actually works. It does that by having a heated tray that cooks the pizza from the bottom while also rotating to alternately expose different sections of the pie to the heating element on top. Both heating elements can be controlled independently, so you can keep heating either the top or bottom without cooking the other side, allowing you to cook your pizzas the way you really like. 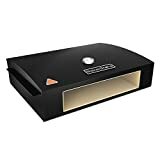 It also makes for a great way to reheat pizzas and other food items, since you can control the heat precisely, while the tray simply continues to rotate, making sure everything cooks evenly. 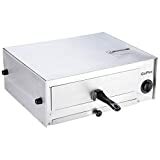 A countertop pizza maker, this appliance has a 12-inch cooking chamber that has heating elements on both the top and bottom panels, allowing it to heat up both sides of your pie as soon as you close down the lid. It has a floating hinge that takes up no footprint on the inner chamber, allowing you to cook even thicker pizzas without any problems. The cooking plates are made from a high-fired ceramic material that’s completely non-stick, so you won’t have any problems cleaning it up after cooking. Do note, there’s no indication as to how long it can cook specific types of pizzas, so you’ll have to experiment as you go to figure out the proper cooking duration. The best part? This thing is so slim, you can tuck it in a drawer when not in use (considering it takes up a 12-inch footprint on the countertop, you’ll definitely want to put it away). Don’t like all that preheating work that comes with pizza ovens? Well, this electric oven allows you to skip all that. Just place your pizza on the rack, turn the knob to set the cooking time, and get it cooking. There’s no temperature setting, but reviews indicate it goes up to around 450 degrees Fahrenheit, which is enough to bake a frozen pizza in 15 minutes and a fresh one in a fraction of that. Yes, you’ll probably have to experiment a bit to figure out the ideal cooking times, but this boxy countertop oven happens to be one of those appliances that seems to make the process really simple and straightforward (so simple, in fact, you don’t even need to use a pizza stone). This outdoor tabletop gas oven boasts double-walled construction that enhances heating dynamics, while specially-designed burners emanate enough heat to raise temperatures to 700 degrees Fahrenheit in around 15 minutes. 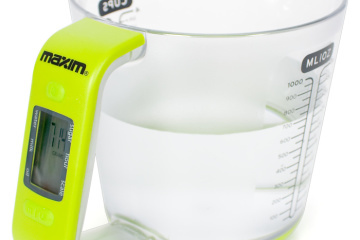 Once preheated, it can crank out crispy pizzas in four to five minutes, with micro-adjustment valves that let you adjust the heat on the fly, in case you want to experiment with various heat settings. Oh yeah, this oven has a slightly different profile than most mini-ovens we’ve seen, as such, it uses a stone that measures 20 x 13.25 inches (width x depth). That means, you can only use it to make one 12-inch pizza at a time, although you can also get away with two 8-inchers, if you want to maximize that wide profile. 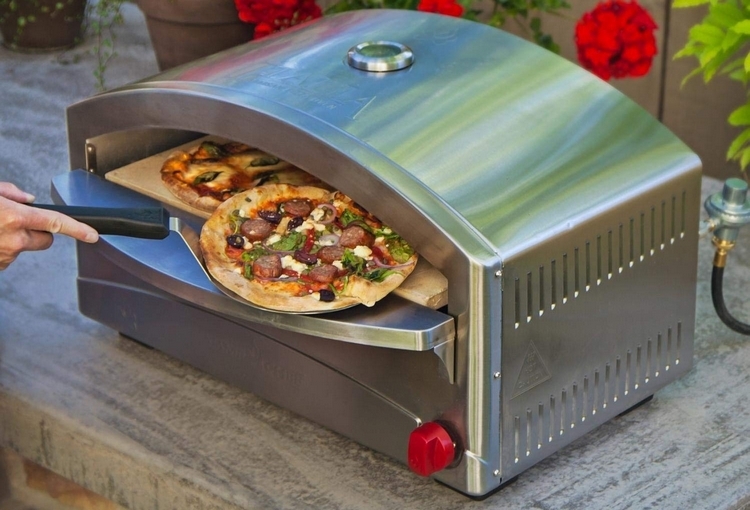 If you already have a large grill sitting in the backyard, then you might want to forego the standalone pizza oven and opt for this “oven box” instead. 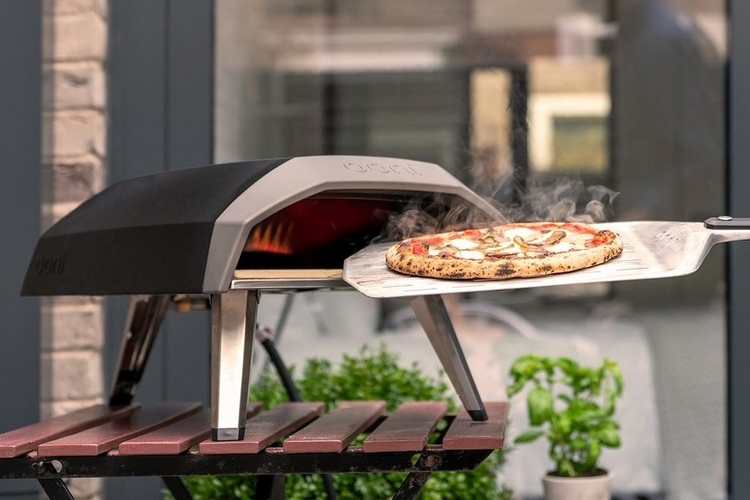 Designed to sit on top of the grill grates, the Baker Stone harnesses heat from the grill using a unique airflow system that circulates the heat efficiently inside, allowing it to reach the required temperatures to properly bake delicious pizzas. It can work with any type of grill, since it doesn’t use any fuel directly, provided the grill is big enough to accommodate the sizeable contraption (it requires three-burner gas grills or bigger). 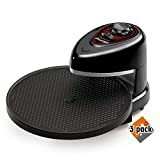 Preheating takes 30 minutes, after which, it can crank out pizzas in just two, making it handy for cranking out multiple pizzas in a very short period. This outdoor pizza oven is mounted on a wheeled rack, allowing you to easily push it around the backyard, in order to find an ideal position for cooking (ideally, one with where it won’t be exposed to wind, which can affect the heating process). Preheating for 20 minutes gets it to around 500 degrees Fahrenheit, allowing you to cook a 12-inch pizza in around five minutes. Yes, it can get hotter, but you’ll have to preheat for over an hour(some say they’ve gotten over 700 degrees after two hours), which might be viable, in situations where you intend to cook multiple pizzas for a party, as getting it that hot should let you crank out pizzas in just two minutes or less. What sets apart the ovens that can make Neapolitan-style pizzas from ones that can’t? Temperature. If you want to replicate wood-fired pizza goodness, you need a cooking area that can heat upwards of 800 degrees Fahrenheit. These products can do just that. 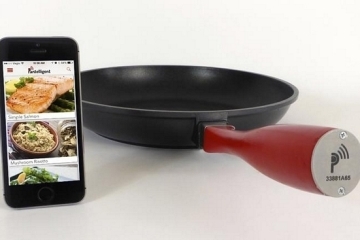 When the original Uuni made its debut as a Kickstarter project in 2013, many were skeptical. 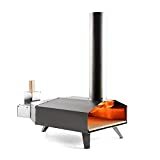 Wood-fired ovens were big, expensive, and used almost exclusively by restaurants, so promising one that’s both compact enough to fit in the average backyard and affordable enough for the average consumer seemed like another crowdfunding project that was biting off more than it can chew. Fortunately, they proved the skeptics wrong and the Uuni 3 is the latest iteration of that original oven. Equipped with a burner designed to use energy-dense wood pellets for fuel, the oven can heat up to 932 degrees Fahrenheit in just 10 minutes, after which you can start cooking 13-inch or smaller pizzas in just 60 seconds each. Made by the same outfit behind the Uuni 3, the Ooni Koda ditches the use of wood pellets for fuel in favor of plain old gas. 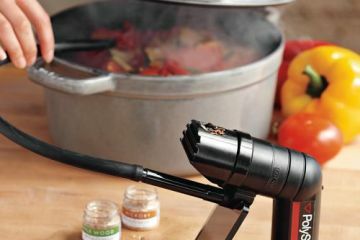 That way, you don’t have to pick up a bag of pellets or order another batch online – just hook it up to a gas line, activate the instant ignition, and preheat the oven for 15 minutes to let it reach 932 degrees Fahrenheit. From there, just throw in a pie and take it out after 60 seconds to get your perfectly-cooked Neapolitan-style pizza right from the comfort of your home. 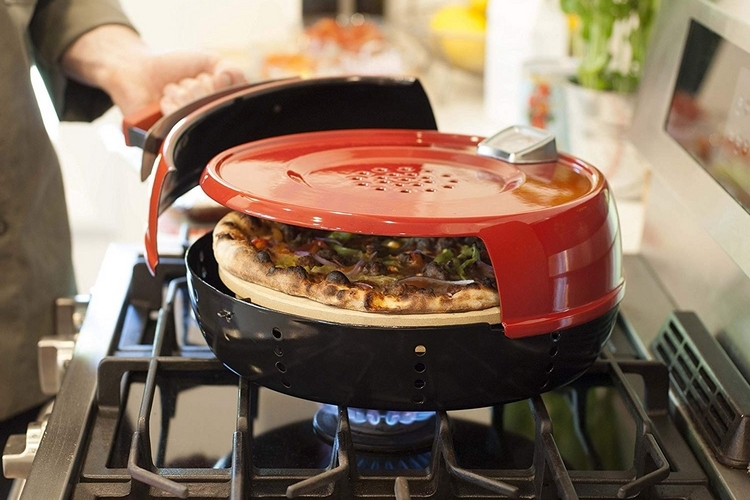 Designed to sit on top of a stove similar to the Pizzacraft Pizzeria Pronto, this cookware lets you bake pizzas right on top of any heat source by trapping it efficiently, allowing it to preheat up to 800 degrees Fahrenheit in just 10 minutes or less. Made from high carbon steel, it can work on any kind of heat source, too, from gas ranges and induction stoves to grills and open campfires. 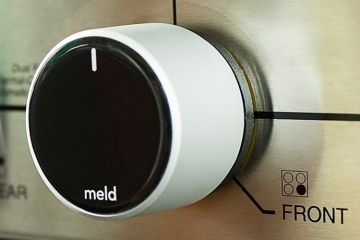 The actual preheating time, of course, will depend on which heat source you’re using (it will heat up faster on an induction stove, for instance, than other options). Once heated to desired temperatures, it can cook thin-crust pizzas in just three minutes, so just adjust the cooking time, depending on the thickness of the dough you’re using. 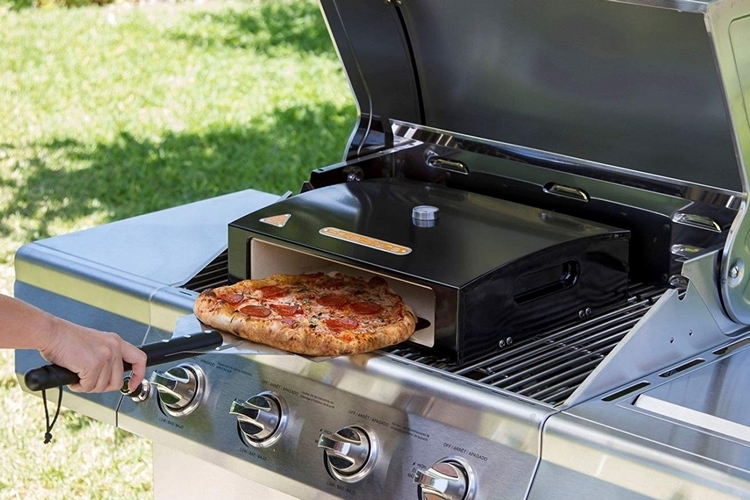 This outdoor gas oven, which conveniently fits in most any tabletop, can heat up to 900 degrees Fahrenheit, allowing you to cook a 13-inch pizza in just two minutes or less. It’s gas-powered, too, so you can just hook it up to an LPG tank to do your cooking, with a portable design (removable oven box, foldable legs) that makes it easy to transport. 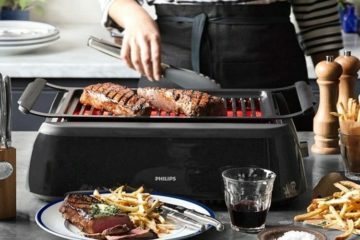 Even better, it’s a versatile appliance, as the outfit sells both a griddle and a grill that can go on top of the heating element, essentially turning it into an entirely new cooking tool when needed. 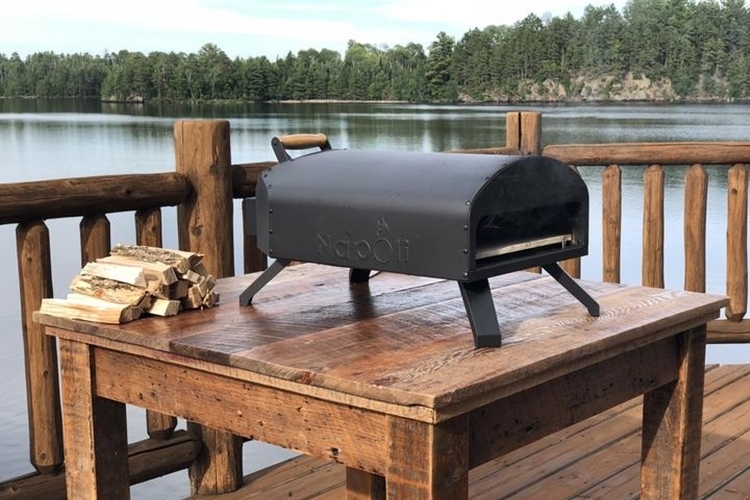 Designed for convenience, the Napoli has a fuel tray that can work with wood, charcoal, and wood pellets, allowing you to use whichever fuel is readily available to cook pizzas at temperatures of 925 degrees Fahrenheit. Even better, it can be fitted with a gas burner attachment that heats it up to 900 degrees in under 10 minutes, making it arguably the most versatile of the compact pizza ovens currently in the market, as you can use whatever fuel is within easy reach at absolutely any time. It’s priced at $299.99. It is such a pain to order pizza from my local pizza shops. Pizza had app order only specials, but you have to order in the app. They have a sign inside the restaurant that shows what the special of the day is but then refuse to give it to you unless you order from the app. So I have to order from the app while inside the store. My old favorite pizza place recently sold to new owners, and it has gone downhill quickly. You used to get a lot of fresh toppings, now the mushrooms come from a can. I think making your own pizza at home is the best bet because you can get exactly the toppings you want. If you want a pound of pepperoni on your pizza then it will still cost you less than buying a pizza. The Pizzacraft Pizzeria Pronto Stovetop Oven reminds my buddy who cooks pizza inside his cast iron skillet. Best pizza I have ever had. I like that the 2 heating elements work independently of each other on the Presto Pizzazz Plus. I can cook up the pizza and then take some of it off for my wife while I leave my on and turn off the bottom heat sensor, so I can get my cheese on top crispy. I love my toppings cooked well done, but prefer a softer crust. I can do it with the Presto Pizzazz Plus! 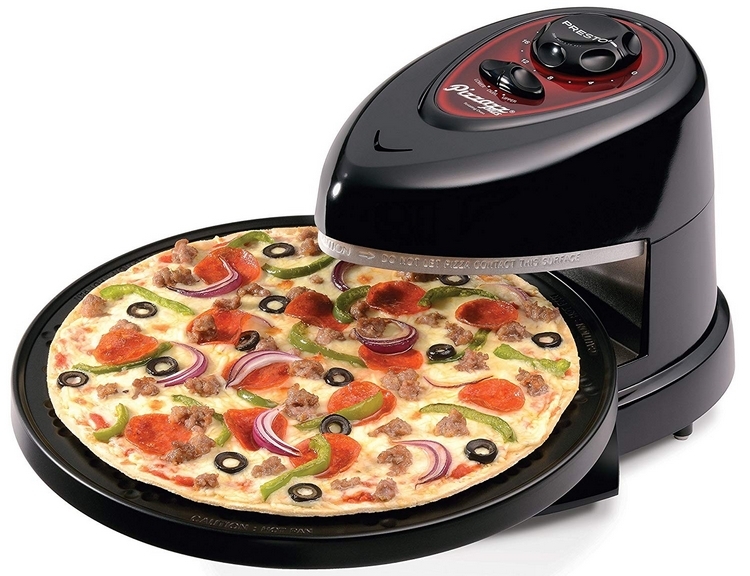 The Betty Crocker Pizza Maker would be a great pizza maker for the college student living in a dorm. A lot of dorms might not allow it, but if you put it away when you are done then nobody will no, except for maybe smelling the pizza as it cooks. 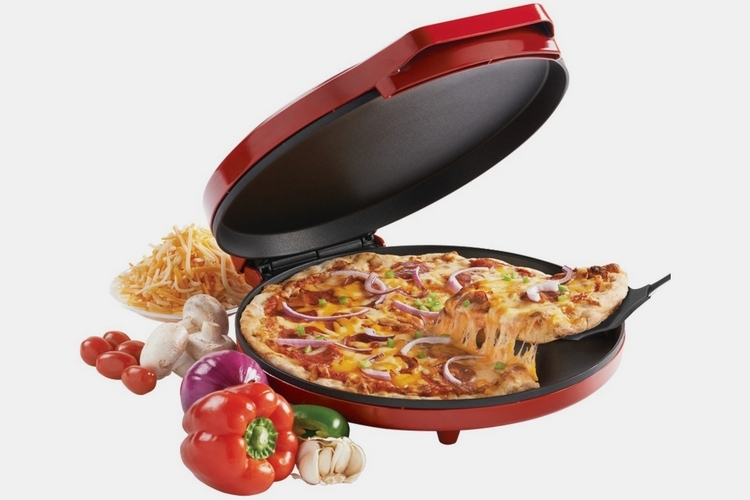 I wish it made larger diameter pizzas, but then it wouldn’t be as portable. 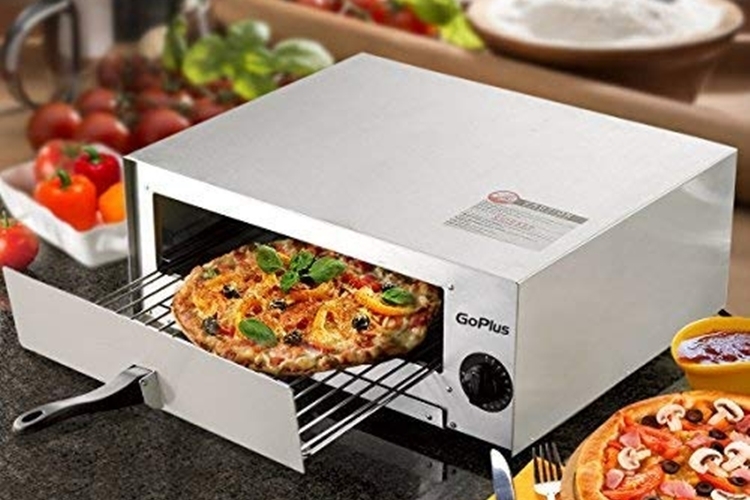 If somebody came out with a pizza cooker similar to the GoPlus Electric Pizza Oven except made from actual bricks, it could potentially be really popular. Much heavier of course, but an actual brick pizza oven that you can fit on your counter would be very nice to have. 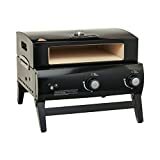 I really like the design of the Camp Chef Italia Artisan Pizza Oven, but if I am going to buy an outdoor pizza oven then I will get one that can handle much larger pizzas. The Baker Stone Pizza Oven Box is something I can see a lot more people using, but it seems expensive for what you get. I do love how it works with the grill you already own though. I wonder if I could get this to work with the permanent grills installed down at our city park. Why does the Hiland Patio Heaters Pizza Oven take so much longer to heat up than a regular stove inside of the house? The good thing is you can eat pizza all day during the summer using the Hiland Patio Heaters Pizza Oven and not have to worry about heating up the house. I don’t think the Hiland Patio Heaters Pizza Oven is the best pizza oven for bachel0rs only making one or two pizzas at a time, but I really like this design. The Ooni Uuni 3 Wood-Fired Pizza Oven is my favorite design of all of these. I wish it could make larger pies, but for the price, I can live with this. 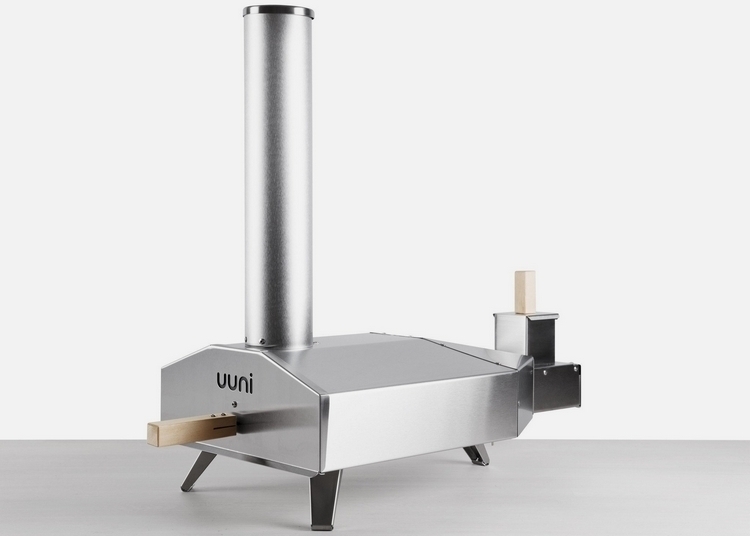 The Ooni Uuni 3 Wood-Fired Pizza Oven heats up fast and will be able to make the type of pizza I like the most. I quit buying pizzas because the prices keep creeping up while the amount of toppings is much less. I hate how PIzza Hut advertises “Any Pizza” for a flat fee, but then charge you extra for specialty pizzas or getting double pepperoni added. 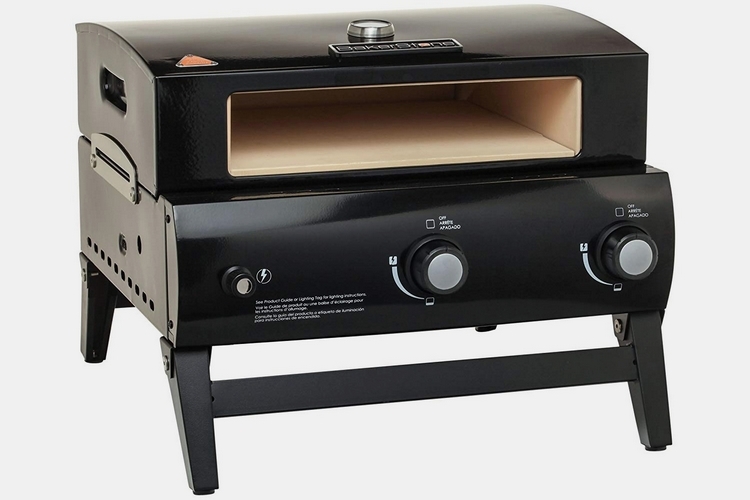 I think if more people started making their own pizzas at home using one of these pizza stoves, then they’d realize that it is more convenient, cheaper, and much higher quality than the pizza you can buy locally. I do like Pizza Pan Pizza. I grew up with it, it is comfort food to me. I do no like that Pizza hut quality continues to decline while prices continue to increase. I bought a small pizza oven and started making my own. I discovered a copy cat Pizza Hut Pan Pizza recipe online. It took a few attempts to duplicate it, but now my pizza is almost indistinguishable from Pizza Hut. I can now enjoy Pizza Hut pizza almost every day, but I make it at home so it is cheap enough I can eat it regularly. I used to work in a small independent pizza cafe when I was a teen. The huge brick oven we had took over an hour to heat up properly, but then you could crank pizzas out of it all day long with no problems. We even had it hooked up to a backup generator in case we lost power for too long we wouldnt have to wait for the oven to heat back up. The Ooni Uuni 3 Wood-Fired Pizza Oven is much smaller than the commercial brick pizza oven that I used, but for home use, it looks like it would make great pizzas. I don’t earn a lot of money, but the Ooni Uuni 3 Wood-Fired Pizza Oven would pay for itself rapidly once you quit buying pizza. Most people prefer the taste of homemade pizza but shy away from it because it is more convenient to just get one from a pizza place. You can premake pizza crusts and store them in the fridge until ready to use, then you just need to add your sauce and toppings and then place it in the oven. It’s quick,, easy, and actually much more convenient than trying to order one online. I also despise how pizza places charge a delivery fee but then don’t give that delivery fee to the person who is actually delivering the pizza. I’ll occasionally buy a take and bake pizza from Papa Murphys. A couple of times per month we go to the local Italian Pizzeria, and they make great quality pizzas! I no longer get pizzas from any of the chains, with the exception of Papa Murphys. My oven got gifted a pizza oven at her office work party, and we have put that thing through heavy use. We make multiple pizzas per week. It is easier to make at home, cheaper, and don’t have to “tip” a delivery person. If you like pizza and have not started making it at home yet, then I highly recommend you buy a pizza oven and start experimenting with different dough crusts to see hat you like. There are a lot of great recipes online. Papa Murphys is also the only place we ever buy pizza too. The toppings are always fresh, but the crust is kind of pain tasting. I am thinking about getting a Pizza oven, then I can make the crust taste much better than Papa Murphys. The best thing is that you can cater the pizzas to your own diet. When you make a pizza it can be a vegetarian one, gluten-free pizza, or any other type you prefer. I generally eat mushrooms and pineapples on pizza, but my kids always have to have pepperoni or bacon on their pizza. Everybody seems to buy Little Caesar’s pizza here in my town because it is only $5.00. I despise their $5 pizzas. There is very little pepperoni and tastes like cardboard. If you have your own pizza oven you can buy the toppings and make a much better pizza for less than $5. 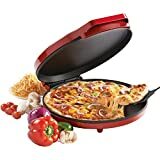 I like the Betty Crocker Pizza maker the best because it is cheap and easy to move. I used to have a nice big grill in my backyard but then had to move into an apartment and had no room for it. I used to cook pizzas in my cast iron skillet on my grill. Little Ceasars has the worst pizza of any chain, yet my kids absolutely love it. I luckily do still have my outdoor grill, but I cannot consistently cook pizza on it in my cast iron skillet. The Baker Stone Pizza Oven Box is the one I want to look into more. If I can consistently get my pizza cooked the way I like it then I will happily shell out the money to buy one. If it doesn’t work then I can just send it back to Amazon. The Betty Crocker Pizza maker is marketing itself as being smaller and easier to pack away, but I actually prefer the larger size of the other pizza makes on here. 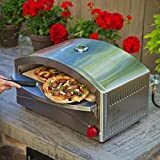 The Baker Stone Portable Gas Pizza Oven looks really appealing because I could use it at home on the patio and even take it when we go camping or tailgating. Fresh pizza out camping sounds wonderous to me! 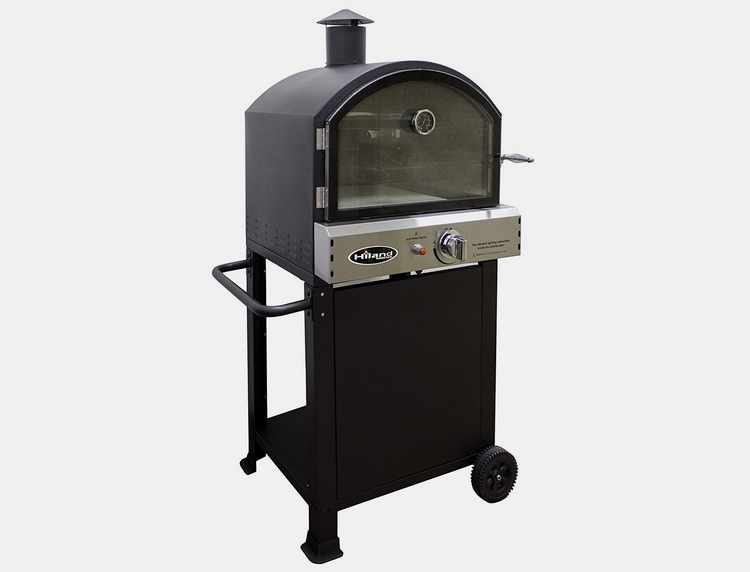 The Napoli Outdoor Pizza Oven is the stand out among all these pizza ovens. It can use different fuels including charcoal, so it is very versatile. It heats up quickly, yet is still small enough you can move it around or take it with you camping, to the park for a picnic etc. The only downside is you can’t use it inside. I guess you can with the propane tank, but I wouldn’t recommend using it inside. The problem with the Napoli Outdoor Pizza Oven is you would get used to such good homemade pizza that it would spoil you and you wouldn’t want to ever eat Dominos pizza ever again. You can easily set it out on your patio though and it would always be right there ready to use. In summertime during the hot weather, you’d be glad that you are cooking outside with it so you can avoid heating up your house more. I saw on the product page that it said it came with Cordierite Stone. I had to google to learn what it is. The Pizza stone is the stone that you place the pizza on when you cook it, but the stones come in 3 different types depending on the brand you buy. Pizza stones can be made of Cordierite Stone, ceramic, or steel. Cordierite Stone is the most durable of the three and can’t handle extreme temperatures much better. It can also go from cold to directly into the hot oven with little chance of it cracking on you. Steel pizza stones are made of steel and not actual stone material, so they don’t spread the heat out as evenly, however, steel pizza stones can handle even higher temperatures than the Cordierite Stones. Considering that the Cordierite Stone heats up just fine in the 900-degree temperature of the Napoli Pizza Oven, I can’t see any benefit to using steel except it is cheaper. Maybe if you were cooking other things besides pizza and needed to go hotter than 900 degrees then I can see how steel might work. Ceramic pizza stones are the cheapest to make and buy. Ceramic pizza stones also are great at conducting heat evenly and transferring the heat to the pizza from the oven. Ceramic stones can last a long time but are more fragile if abused or not handled properly. I didn’t realize that traditional pizza is cooked at such high temperatures. I just assumed it was normal for a pizza to sit in the oven at 400 degrees or so for 15-25 minutes. At 900 degrees it only takes a few minutes and the top of the pizza comes out much better tasting with the toppings crispier. I never realized I needed a pizza oven until I saw this article. Once you start making pizza like this at home you’ll begin to realize how awful the pizza is at Pizza Hut and other chains. My favorite is loading one up with mushrooms, tomatoes, and swiss cheese. For the sauce, I just use some light oil brushed on. It tastes much better than store-bought pizza and is so much cheaper to make. I always use mozzarella for my pizza. I like swiss cheese but have never used it on pizza before. Might have to give that a try. One thing I add that a lot of fo people don’t care for is sauerkraut. I love sauerkraut on my pizza with some cooked up spicy sausages sliced really thick on top. The spicy sausage is cheaper than buying pepperoni and tastes even better. I enjoy fresh mushrooms on my pizzas, but with the exception of one local pizza place, all the rest skimp out on mushrooms and refuse to add very much to it. The mushrooms also do not taste fresh. I want fresh mushrooms and a lot of them. I think it is definitely time that my family invests in a quality pizza oven so I can have all the mushroom pizza I desire. I’ve given up on buying pizza locally. The underpaid staff that doesn’t care and overpriced pizza. There is only one local pizza joint that I like, and unfortunately, their hours of operation are so erratic you never know if they are going to be open or not. I have been there on Saturday nights when they have closed up. I make my pizza at home and don’t miss having to deal with the illiterate high school stoners who work at Dominos. Until I can decide which pizza oven I want to buy, I have been making it in my oven. I buy the pizza crust that comes in the refrigerated roll. I unroll it onto a cooking sheet and then add sauce, cheese, and spicy ground sausage that I pre-cooked with onions and green pepper. It is not the best pizza in the World, but it does taste much better than Dominos and Pizza Hut. Sounds great except for the onions. I am not a picky eater and I love onions, but I despise onions on Pizza. I even like anchovies on my pizza, but definitely keep the onions off of it. Unless you are stuck in a college dorm room, I suggest you buy an outdoor pizza oven and not an indoor one. When you are looking at a compact pizza oven and are on a budget, you will get much better results with the outdoor pizza ovens. I own the Roccbox and really enjoy using it, but there are many great ones for sale. I have read a lot of good things about the Napoli pizza oven too. I disagree with you. I do not find cooking pizza at home to be more inconvenient than calling from my local pizzeria. It used to be that way, but Pizza places have seemingly made it much more difficult to order. I get charged a delivery fee, yet the delivery fee does not go to the driver. It is a scam and I won’t do it anymore. Been cooking pizza at home regularly for 6 months now and the quality is so much better than buying it.